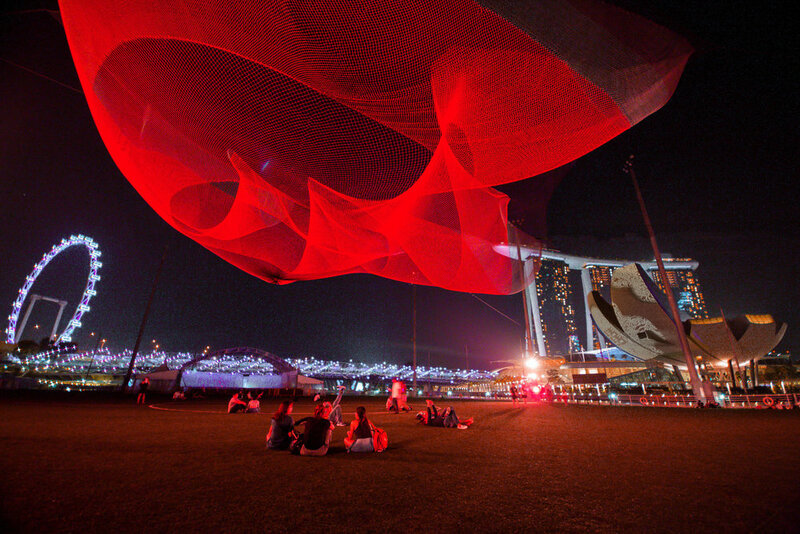 For its fourth exhibition, 1.26 was installed in Singapore above Marina Bay for the biennial iLight Festival. Janet Echelman created 1.26 just after the 2010 Chile earthquake when she learned of NASA data that measured the effects of the earthquake on the planet. The vibrations momentarily sped up the earth’s rotation, shortening the length of the day by 1.26 micro-seconds. This became the catalyst for the artwork, and her studio collaborated with a team of brilliant engineers, lighting designers, computer scientists, and architects to create the work which is the first in Echelman’s Earthtime series. The sculpture is completely soft and constructed from highly technical fibers, making it lightweight enough to lace directly into existing structures without extra reinforcement. Its billowing surfaces are animated by the wind, contrasting with the rigid surfaces of surrounding city architecture. At night, colored lighting transforms the work into a floating, luminous form. The sculpture takes on new meaning with each installation, as different cities bring new context to the 1.26 story. Developing a different color palette for each installation allows Echelman to express a desired mood and content specific to the location. In Singapore, the lighting sequence unfolds slowly, creating calm amidst the bustling city. Deep blues fading into the night sky instill a feeling of mystery and enigma, creating a counterpoint to the vibrant oranges and reds that follow. The work is designed to be an ephemeral, floating form above Marina Bay, where the lines between sky, sculpture, and water become blurred. The physical sculpture is entirely soft, made of two types of fiber. Spectra®, a fiber more than 15 times stronger than steel by weight, makes up the structural portion of the artwork. Custom color blends of high-tenacity polyester braided twines make up the remainder of the sculptural net. Echelman combines these with programmed colored light to create the final artwork. Lighting Design: Martin Professional Pte. Ltd., Kurihara Kogyo Co., Ltd.